Chess has always been one of the greatest mind games ever developed. Even today, besides the development of lots of new games implementing modern technologies, chess still managed to retain its charm. Lots of people still play chess and find it quite amusing. However old chess is being modernized by implementing modern technologies. Chess is an interesting game to play as it tests the attentiveness of the mind of the player and how clever he is. As with the other games, chess has also been developed from a number of developers and there is a tough competition among them. I am going to summarize the top 5 3D chess games for android ever developed. The 3D Chess Game deployed the most famous chess engine to give the android users an ever enchanting and challenging experience of playing chess. You can also choose your opponent of variable strength as well to judge your capabilities. You can play this awesome 3D Chess game against any human or artificial intelligence bot built into the game engine. Droidfish deployed one of the strongest chess engines ever developed, stockfish. The game allows you to play chess in two player mode giving you an awesome graphical interface. You can also edit the board and color themes to adjust them according to your choice. The playing strength is adjustable and clocks are also available. Besides this, the app is completely free. ChessGenius is an award winning chess program and the program has won 10 world championships. The game gives you a tutor to let you learn to play chess. The game also gives you hints and 33 levels. The UI is quite cool as well. The game also allows you to save and load the games. The game has a current rating of 4.6 and people love to play this game. The biggest plus point of chess free is that it is completely free for chess lovers. The developer of this game has been awarded the top developer of 2013. The game gives 12 exciting levels from beginner to expert. The game deploys treebeard chess engine that give human like interface. Tutor is also available and a unique feature that lets you know what the simulator opponent is thinking about the next move. Chess stats are also available to let you check your playing history. If you are a beginner and don’t know anything about playing chess then this game would be a best option for you. Chess for android highlights the possible moves so that you can know which moves are valid. The game consists of a chess engine a great UI to attract the players. You can adjust the difficulty levels according to you. The game is free to install and has a rating of 4. 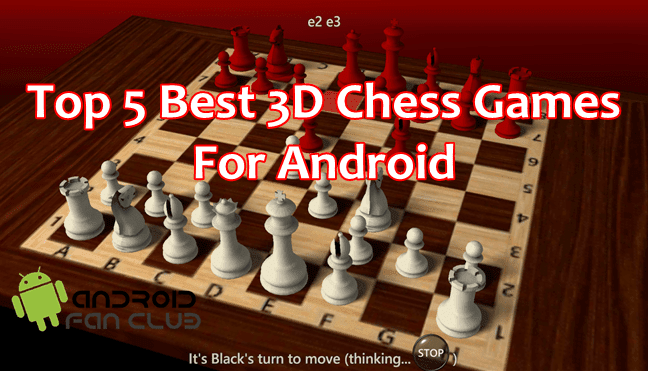 If you are a chess lover then this list of 3D Chess Games For Android might help you playing your favorite game on your android device anywhere. If you think there are some chess games which should be in the list, do comment below to let us know.